The April Juice of the Month is a mighty fine one, indeed, vape fam! If you’ve been craving something sweet and creamy, fruity yet smooth, this is the juice you need in your tanks. Strawberry Shortcake Ice Cream is one of our classic, time-tested VF Specialty Juices that always hits the spot. This month, while it’s got the spotlight shining on it as our Juice of the Month, 60ml bottles will be on sale for just $19.99, giving you the fantastic savings of 25% off for the whole month! Get shopping y’all, this is a juice to get into your tanks ASAP! The Juice of the Month is all about bringing you the savings on a vape juice we think you need to take notice of. As you know, we carry a lot of vape juice; in upwards of 30,000 different possible flavors, to be exact. And with all that variety, we know how important it is to have a liquid that not only tickles your fancy but also quenches your thirst for bold flavor. Each month we highlight something new, changing it up every time so you’re never left desiring more. 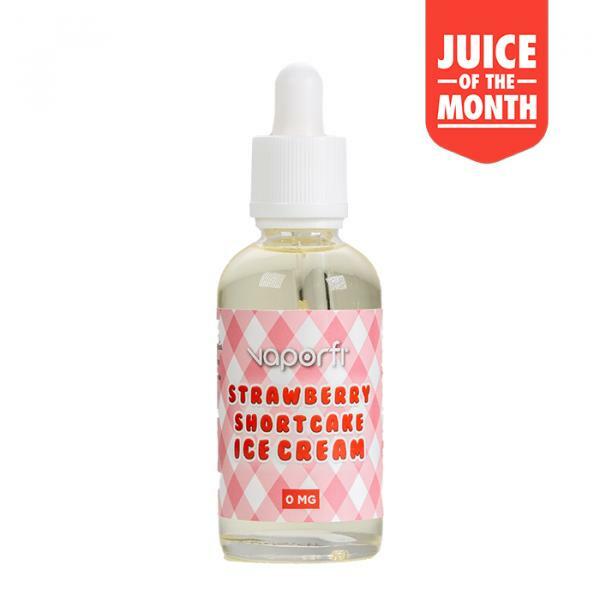 If you’ve never tried Strawberry Shortcake Ice Cream vape juice from VaporFi, well my friends now is your chance to do so at an incredible discount. This is one of our most beloved juices, one we have become quite known for, an absolute classic in the vape world! Rich, creamy, luscious, and fruity, it covers all necessary points for an e-liquid. If you have tried this juice, then you know what we’re talking about! Remember those magical strawberry shortcake ice cream bars they used to sell in school cafeterias during lunch time, back in the day? The one treat that made the never-ending school day halt for a few moments of gastronomical bliss during our lunch hour? Those were the days! Well, this vape juice harks back to that simpler time, offering up that blissful flavor in the form of vapor, which can be used anytime you need a sweet escape. It all starts with the richest, smoothest base of vanilla bean ice cream, which is perfectly blended with the bold taste of sun-ripened fresh strawberries. It is then taken to a new level with the addition of a cake crumble essence within the flavor, adding the “shortcake” aspect to the already-impeccable strawberries and cream. It is at once refreshing and luxurious, creating the perfect balance of tastes to envelope your senses! Once you experience this richness, you’ll understand why this juice was an instant classic and why it remains one of the most popular juices in all the land. It’s a dessert vape juice dream! This month, we are giving you every reason to take advantage of the smooth, sweet savings coming your way with the Juice of the Month. Strawberry Shortcake Ice Cream vape juice will be specially priced at 25% off, with all 60ml bottles going for just $19.99, so stock up and save; this is definitely a flavor worth having a supply of! Nothing beats amazing flavor when vaping! Which is the Best Electronic Cigarette for Sale? What’s the Best Tank for the SMOK Alien? What’s the Best Sub Ohm Tank for Clouds?